I love experimenting with makeup. When I do, I feel like I'm 6 again playing with my mom's makeup set. 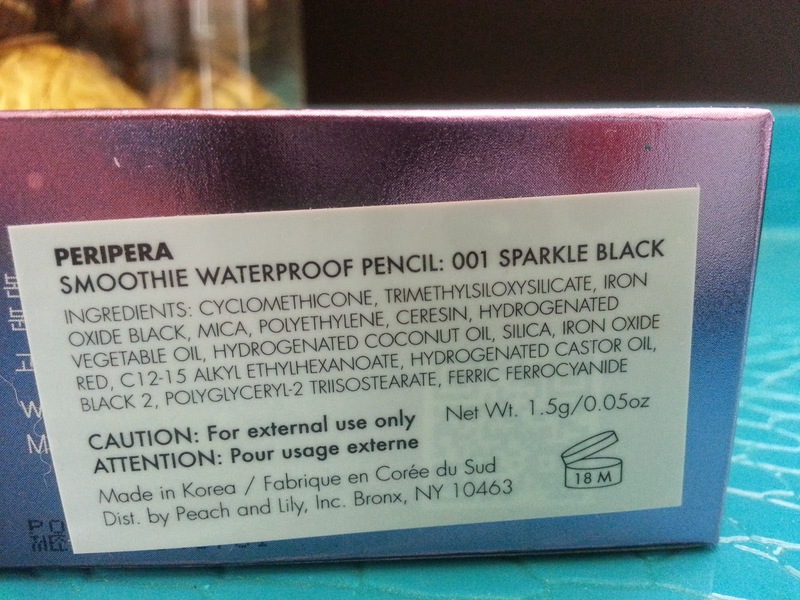 So,when I got this Peripera Smoothie Waterproof Pencil Liner in my Peach and Lily's Seoulcialite Box ($49), I was happy for another experiment. While I have a lot of eyeliners, I'm still looking for that perfect smudge proof +waterproof+sebum proof combo gel liner pencil. So far, I've had no luck finding it. I'm also picky with eyeliners that needs a sharpener. For some reason, the sharpened eyeliner never comes out the way I want it to. Many times I end up wasting a bit of product trying to get it pointy-ish. Even then, sometimes it still comes out, well, not pointy. Does anyone else have this problem? Or is it just me? Have not tried to sharpen the Smoothie liner yet, will report back when I do! I have, however, added this one to my stash. 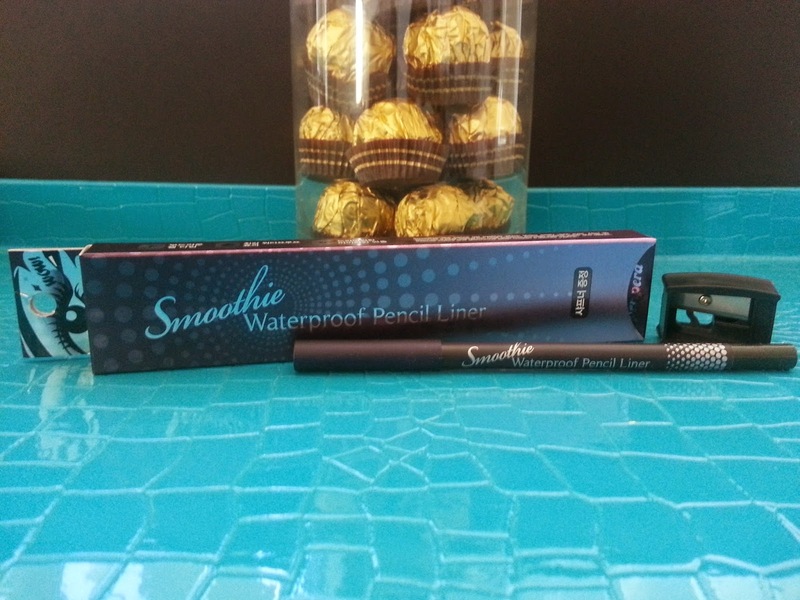 Read on to see my thoughts and ratings on this product! A shimmery gel eyeliner that has a smooth texture, hence its 'smoothie' name. 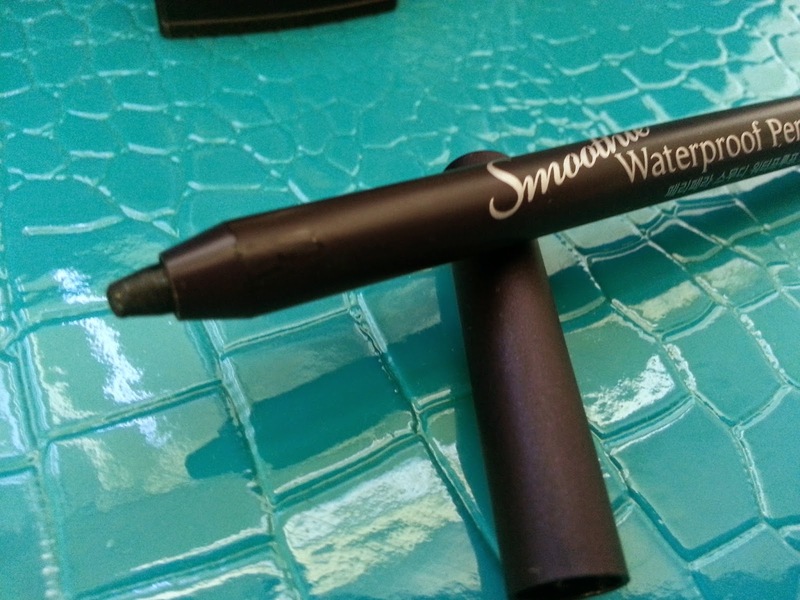 It glides on effortlessly and is waterproof and smudge proof. It lasts all day and night, plus it comes with a sharpener. 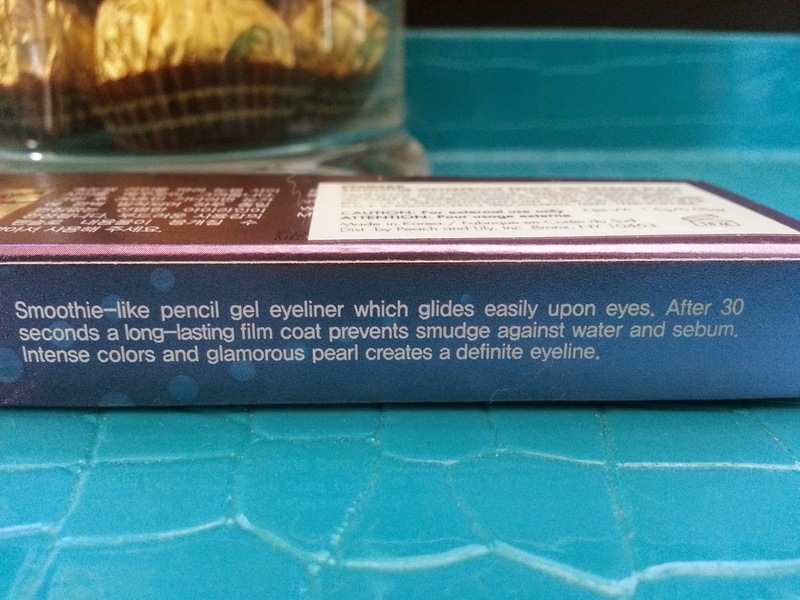 You can use it as eyeliner or even eye shadow too! I'm always on the look out for that perfect combo of waterproof, sebum proof, and smudge proof gel pencil liner. Most gel pencil liners I've tried are waterproof but lack slightly in the smudge proof department. 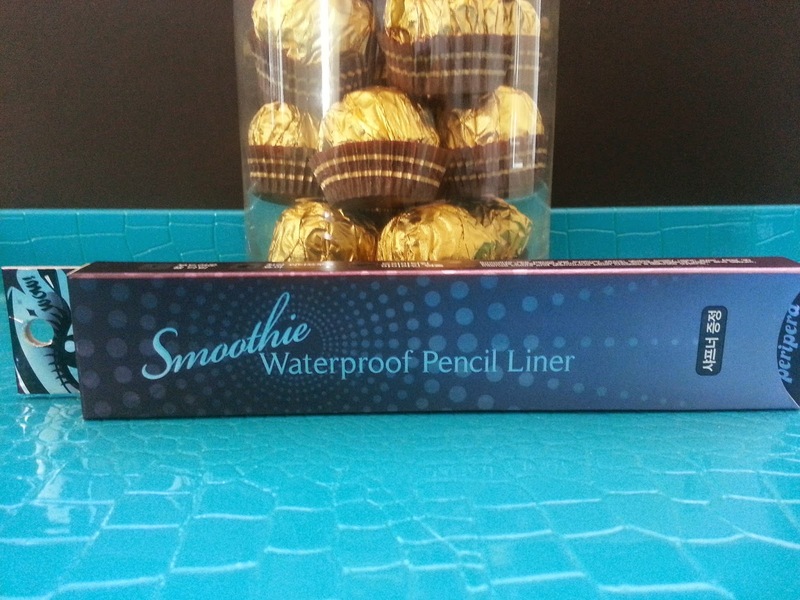 Peripera's Smoothie Waterproof pencil liner was much better than most but still lacked a bit. It's smudgy when you first apply it, but that allows you to blend it out and can be used as an eye shadow. After a while, it will set. I did my usual smudge proof test which involves testing it on my eyes a couple of times for 12 hours each and also testing it on the back of my hand. It scored a 90 out of 100 on my smudge proof test. 90 out of 100 is a pretty good rating in my books. It's not perfect but it's so much better than most! Out of all my liners, only two rates higher than this one. For me, that's pretty darn good. It's not completely smudge proof but I've yet to come across one that is. My multiple 12 hour test showed that with a good primer it's pretty smudge proof for the first 9-10 hours. After that it can get a bit smudgy on the corners of my eyes. I am still looking for that 99%-100% smudge proof + waterproof + sebum proof liner and hope I can find one in the future. But for now, 90% is gold. This Smoothie liner lost a heart because I'm not a big fan of soft eyeliners in plastic that needs to be sharpened. While I don't like pencil liners that needs to be sharpened in general because that tend to cause product waste, I especially don't like the ones in plastic. If they are anything like the ones in plastic I've used in the past, sharpening it will be difficult. I have not sharpen mine yet and I've just been using an eyeliner brush on the remaining bit on top. Will report when I do sharpen it. Another reason why it lost a heart is because it's not super smudge proof/ waterproof/ sebum proof. For my semi oily eyelids, I need one that really won't budge. The Peripera liner didn't beat my top two favorites but it did come pretty close. 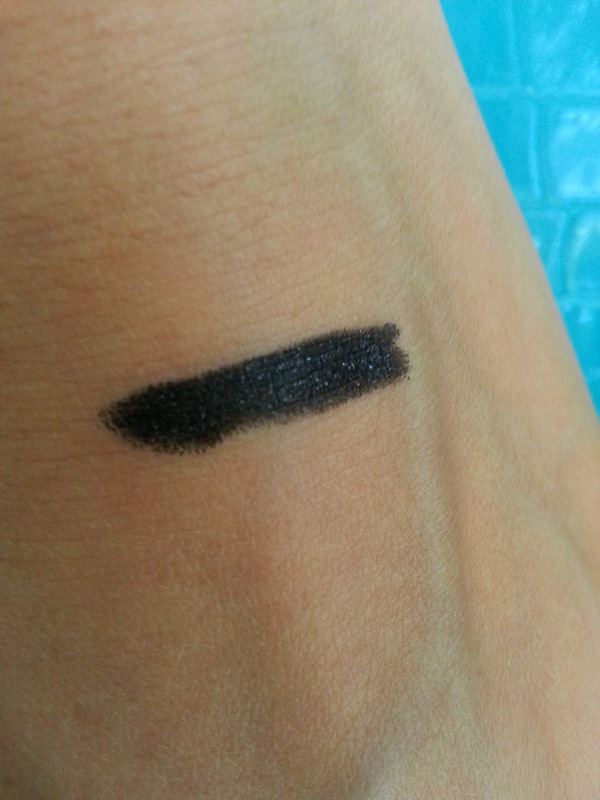 Now, it got 4 hearts because it is a waterproof eyeliner with a beautiful sparkly black finish that isn't too sparkly but it still makes the black color look less dark and more playful. Swatch below. It does have a smooth texture (Really SMOOTH!!) and glides on very easy, which I like a lot. The eyeliner can be easily removed with eye makeup remover and it doesn't leave behind any residues. Plus, it comes with its own sharpener. Oh, and did I mention, it's not a costly product either! Would I purchase the Peripera Smoothie Waterproof Pencil Liner in the future? Not sure yet. While I love the color and how smooth and easy it is to apply, I am a bit disappointed that it's not as smudge proof/sebum proof as I would like. Still I love it lots. It does smudgy less than the majority of my eyeliners, so I do use it often and just bring it along for a touch up or two. If I can figure out a way for it to stay without that bit of smudging, I think I will want try out other colors in this line. Thank you! I get so annoyed when it comes out jagged, I just end up using my eyeliner brush in the end lol. Yeah, I didn't realize either until I tried to twist it. Still haven't sharpened it yet, just been using my eyeliner brush and will keep using eyeliner brush until I have to sharpen it. It's a beautiful eyeliner though and definitely worth keeping.